DR. RUSHDI CADER is the medical director for the San Luis Obispo Regional SWAT Team. He is also a tactical reserve officer with the Hawthorne Police Department and is president and CEO of SWAT Trauma Assistance Training, Inc.
for 2008 SHOT SHOW in Las Vegas! Out of 1,950 exhibiting companies in 715,000 sqft of exhibit space, SHOCKNIFE was given the BEST OF SHOW AWARD by Sgt. Steve Gibson, Publisher/Editor of 24/7 Cop to Cop News at the 2008 Shot Show in Las Vegas, NV. "Shocknife Breakthrough Training DT Technology Recalibrating and Redefining Corrections Officer Survival and Edge weapon Training"
Joseph Garcia is a Senior Team Leader with US C-SOG, the nation's largest full service CERT government contractor. Team Leader Garcia is the most published author in the area of CERT Operations in the world. Senior Team Leader Joseph Garcia speaks about his experience with the Shocknife and the impact it has had on the Correctional CERT Market. Listen to the podcast online or download it here. Sgt. Jim Wagner claims that the Shocknife enhances reality-based training by teaching respect for the blade. When I see how the average martial arts instructor does a knife disarm, I feel sorry for him because most of the techniques simply don t work. . . . Those daring moves end as soon as the Shocknife enters the picture. . . All the fancy stuff disappeared. Fear has a way of doing that. Sgt. Wagner is a police and military defensive tactics instructor and a civilian reality-based personal protection trainer. One of the biggest drawbacks to traditional edged-weapon defensive training is that no one is really afraid of a rubber knife with chalk on it. Fear can be a great motivator and some harmless pain can reinforce instruction quickly. . . . Most trainers who have seen and used the Shocknife agree that it performs as promised, inducing fear and providing vivid reminders to lessons that are otherwise a bit sedate. 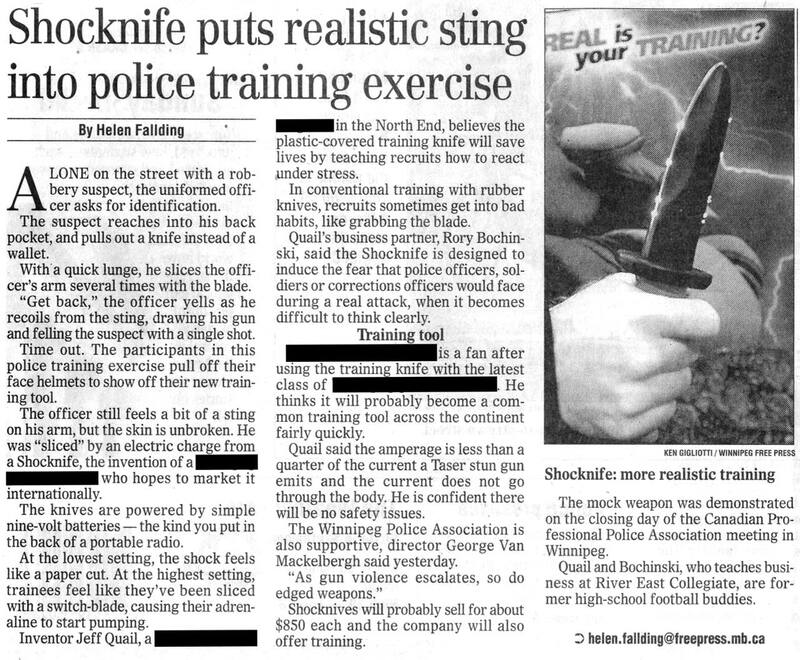 Any type of reality based training will be made more real with the Shocknife. - Deputy Schroda is a full time Deputy and Defensive Tactics Instructor with Wood County (WI) Sheriff�s Department and long time student of knife defense. Shocknife Inc. Certified as a Top 10% Performer! September, 2006 � Shocknife Inc. has been certified as a Top 10% Performer based on the D & B Past Performance Evaluation survey responses of its reference customers. Shocknife Inc.�s PPE score of 96/100 demonstrates outstanding overall customer satisfaction relative to similar companies. 2006 Smart Partner Award for Innovation. The Smart Partners organization consists of a partnership between the City of Winnipeg, Province of Manitoba, & Western Economic Diversification Canada. Mr. Markel is a well-known law enforcement writer, and a police officer in Millersburg, OH. He is a leading use-of-force trainer in the mid-west, and has provided VIP protection to clients in the United States and abroad. He is also an Advisory Board member of the US Police Officers Safety Association. Check out the Xtreme CERT Special Operations Conference and Expo. was finalist in the Law Enforcement Product News/Law Enforcement Technology News Innovation Awards in the Training Product Category. Get Scary Real! Force-on-force turns up the stress for more realistic training! 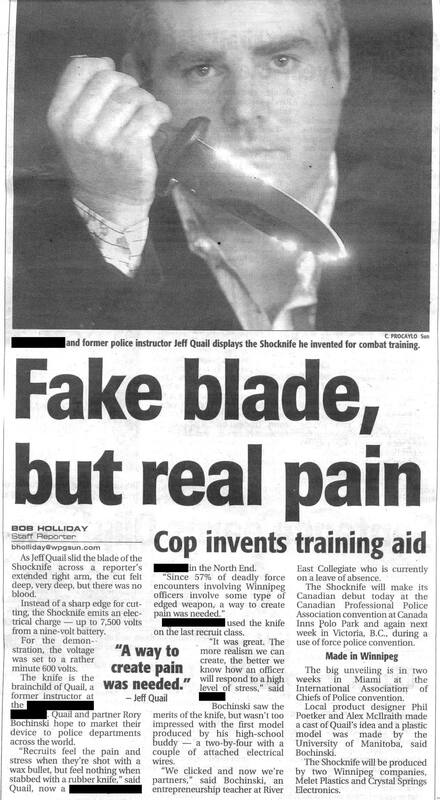 “Approximately seven months ago, a new product, the Shocknife, was introduced into the law enforcement market. The result of this excellent training device is that the student receives immediate feedback on the technique performed. The trainee will feel as if he or she has actually been cut. Moreover, the sensation lingers for several minutes. The body is fooled into thinking that it has been cut and sends a pain stimulus to the brain. Having used the Shocknife myself, I can vouch for the immediate feeling of having been slashed. I spoke with FBI Special Agent Ray Flannagan about the Shocknife. Ray teaches DTs at the FBI Academy in Quantico, VA. He told me that they are in the process of evaluating the Shocknife, and he feels that it is an excellent tool, especially for specialized units and scenario-based training. "The Shocknife elicits fear in the trainee just like a real knife would," Flanagan said. 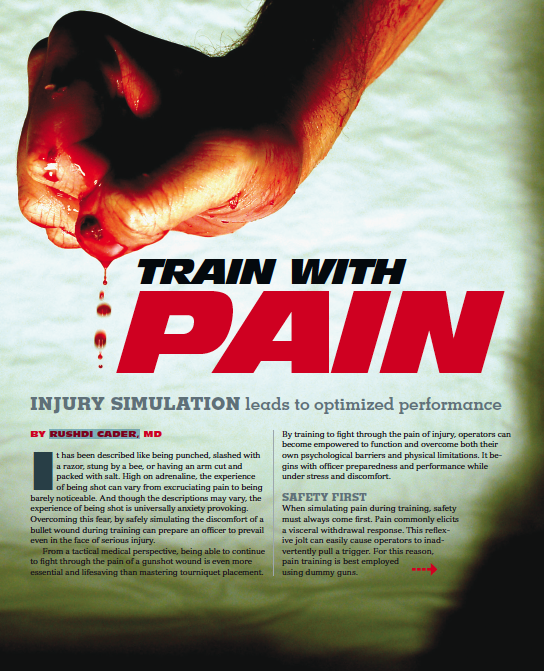 He added, "Having a pain response adds the element of realism that gives value to our training." Flannagan's colleague, Special Agent Butch Greathouse, echoed the same sentiments and said that he is a huge proponent of anything that adds realism to training, "That's what ultimately keeps our people alive," he said. Spent 2 years in the U.S. Army before serving 12 years with the Chicago Police Department (CPD). He left the CPD to become an FBI Special Agent, working organized crime, violent crime, and drugs. John served as the Principal Firearms Instructor, Training Coordinator, and sniper team leader in the Detroit Division for 10 years. Before retiring from the FBI, he spent 7 years teaching at the FBI Academy at Quantico, Virginia. He has taught Street Survival domestically and internationally, as well as supervised new agent training at the Academy. For more information and introductory pricing, see our order page. For more information and pricing, see our order page. 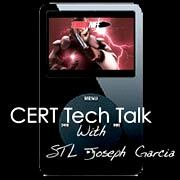 Joseph Garcia is a Senior Team Leader with US C-SOG, the nation's largest full service CERT government contractor. Team Leader Garcia is the most published author in the area of CERT Operations in the world. Knife Training that will Shock You! “After two hours with the knife, this is by far one of the coolest training tools I have ever looked at. As soon as the Shocknife was activated, students displayed a noticeable stress reaction. Their hearts started racing and breathing rates increased. All participants told me that they felt an adrenalin rush. I noticed that motor skills deteriorated as participants began to defend against the Shocknife. I highly recommend getting the Shocknife for your training toolbox. I believe it constitutes one of the most important tools that you can add to make your practice more realistic and effective. The entire group praised this as one of the best defensive tactics classes that they had ever taken." Mr. Mroz is a police officer in Western Massachusetts, currently assigned to his county’s counter drug/gang task force. He is an internationally recognized authority on defensive tactics, firearms training, and training methods. "I put the Shocknife® through its paces and found that it performed as designed and intended. Law enforcement, military and corrections trainers will benefit from this advancement in edged weapon training. The pain of a “cut” will soon pass but the lessons of the Shocknife® will last…and that is the shocking truth in training we are all after." - Kevin R. Davis is a full-time law enforcement officer assigned to the training bureau. A 23 year veteran of law enforcement, he was a Team leader and lead instructor of his agency’s S.W.A.T. Team. He was a personal student of the late Master Mike Inay in the Filipino art of Inayan Eskrima. The Discovery Channel's September 28th edition of the Daily Planet ran a news segment about Shocknife. The video segment can be viewed under the story title "That's Gotta Hurt" on this page.